Resting on a leaf, click on photo to see larger picture. So much controversy over such a tiny butterfly-the Karner Blue, Lycaeides melissa samuelis. A beautiful pale blue, this tiny creature only lives in its adult form for one to two weeks. Named by Vladimir Nabokov (probably better known for his writing than his lepidoptery), there were once so many butterflies that all one could see were clouds of blue. Now, only a few hundred survive in the Pine Bush. There are no laws to protect an ecosystem. But there are laws protecting endangered species. 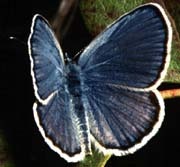 Save the Pine Bush uses the endangered Karner Blue butterfly as the legal basis for its lawsuits to save the Pine Bush. The butterfly lives in others places besides the Pine Bush. There are spots of butterflies in Clifton Park, New York (about 20 miles north of the Pine Bush), and in New Hampshire and Michigan. Last I knew, the butterfly has become extinct in Ohio. Here are a sampling of articles on the PB's most famous resident. Ed. Scientists studying the Karner Blue are required by law to get a permit because they might possibly hurt a butterfly. Developers running bulldozers which kill hundreds of butterfly larvae and eggs at a time are often allowed to destroy as they please.